THE ENDERS HOTEL Brandon R. Schrand 230 pages, softcover: $17.95. University of Nebraska Press, 2008. 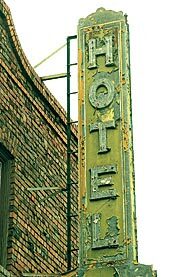 The Enders Hotel, winner of the 2007 River Teeth Literary Nonfiction Prize, chronicles a childhood and coming of age in Soda Springs, Idaho, amid the beauty of the high desert and the rampant alcoholism of a Western "company"town. After stints elsewhere in Idaho and in Washington, young Brandon Schrand, his mother, and stepfather settle in Soda Springs to help Schrand's grandmother run a brick hotel on the main street of town. Much of the book details the magic of Schrand's childhood in the hotel: "We spun around on the stools, drinking our cold drinks, eating pie, and discussed plans for the clubhouse. "Occasionally, Schrand stumbles upon the adult world in which his parents and grandparents live: passed-out men on stairways, a dispossessed trapper picking through the dumpster, a confused man with a revolver in the lobby's phone booth. Schrand captures surprising details of rural life in the West, describing how his grandmother and her female friend guide him on his first hunt. Other times, he tells stories that are all too depressingly familiar: His grandfather is hospitalized over an hour's drive away, and his stepfather intermittently takes work in neighboring states. Many of the town's residents struggle to find and keep work, and when they fail, they often end up at the local bars. Like the best memoirists, Schrand's personal story reflects larger cultural truths: The transitory lives of his grandfather and stepfather mirror those of the down-on-their luck drifters who gravitate to the hotel. The family's boom-and-bust finances parallel the town's mining-based economy. Schrand's grandparents are kind to their neighbors in the rich tradition of close-knit Western communities. As the growing boy looks for a role model among the strangers who stay in the hotel, the short chapters and the guests' brief appearances accentuate the sometimes uneven feel of a first book. Nevertheless, Schrand's memoir of the small Western town breaks new ground. As Schrand searches for his own manhood, he watches the trains that travel through the sagebrush valley and reflects, "They were traveling to places that mattered. "Many small Western communities struggle to survive on hard work, luck, and kindness; The Enders Hotel makes Soda Springs and towns like it finally matter.